I remained on active duty for 6 years, 9 months, and 7 days. At that time I held the rank of E-5/SSgt. During those years I transferred several times with two overseas deployments. One to Vietnam and one to Goose Bay Labrador, Canada. At the time I was stationed at Francis E. Warren Air Force Base, and had been there only 10 months when I got orders again for overseas. I was tired of moving so often so I decided to get out of the service and attend college. I had gotten accepted at Ricks College (Now BYU Idaho). 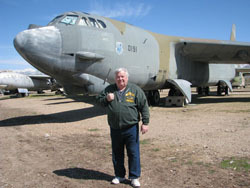 I didn’t want to completely end all of my military service so I went to the Air National Guard base in Cheyenne, WY. I went to the Recruiters office and asked where was the nearest Air National Guard Base in Idaho. Their response was, “Why do you want to go to Idaho. We have a full time job for you right here.” The Chief of Security Police was looking for a Security Police Supervisor to assist him in supervising and managing a full time Security Police force of 9 individuals. He interviewed me and hired me on the spot. This was in March 1976. 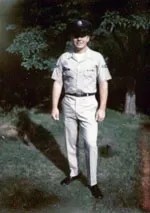 I explained I still had approximately 3 1/2 to go until my enlistment was completed and he said, “I’ll hold the position for you.” I was discharged from active duty on 30 June 1976 and on 1 July 1976 I enlisted in the Wyoming Air National Guard. I was a State of Wyoming employee for the next four years, but had to wear the military uniform and be a member of the Air Guard. At the end of the four years, The Chief of Security Police transferred to Adjutant Generals Office and I was hired as a Federal Technician and replaced him. A year after that I received a direct commission to Captain and was both the Commander and Chief of Security Police. In March of 1990 I retired and received a job in Gillette, Wyoming as a Deputy Sheriff. 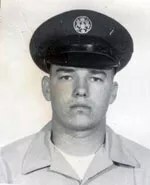 In 1970 – 1971 I served at Phu Cat Air Base, South Vietnam. My first 8 months I was assigned to the 1st Tig er Division, Republic of South Korea as an Intelligence Liaison Officer. My last four months in country, I worked in law enforcement. During my 12 month tour, I experienced 11 rocket attacks, My life was threatened by two intoxicated Korean soldiers and by some American soldiers when I had apprehended one of their members for being intoxicated and fighting with one of my subordinates. In addition, two members of our squadron were killed in Feb 1971 when the jeep they were patrolling in ran over a land mine (IED as they call it today) and killed them both. On 29 July 81, Cheyenne experienced a destructive tornado. 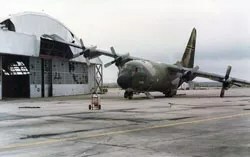 The Air National Guard facilities and six of our 8 aircraft were heavily damaged. Nine other members of Security Police and myself, received the Humanitarian Award for Disaster Relief Operations. 1 Aug 1985, Cheyenne experienced a deadly flood which killed 12 and injured approximately 50 individuals. Myself and several of my subordinates were called upon to search and retrieve several flood victims and again were awarded the Humanitarian Award for Disaster Relief Operations. On 5 March 1986, I received a Letter of Appreciation for assisting the Secret Service Team in coordinating and managing Security for then Vice President Bush when he visited Cheyenne, Wyoming. Travis AFB because it was very close to my home town of Monterey California. Kingsley F ield, Oregon because it was Air Defense Command and was where I met my future wife. Hated Goose Bay, Labrador. Too much snow and very little to do off duty. Served 14 years as a full time guardsmen and many outstanding subordinates who were very instrumental in our OUTSTANDING rating in Aug of 1989 during an ORI/MEI. Plus I received a commission to the officer ranks. At Travis AFB I worked as a Security Alert Team Leader and eventually as a Complotter. 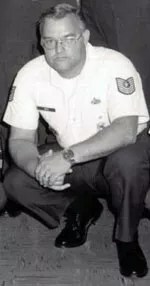 My Flight Chief was TSgt Thompson. I really enjoyed working for him. Sometimes on our last day shift I would ask him if I could get off a few hours early because I would either travel to Monterey or Klamath Falls. He would express his worry and concerns asking me, “What if something happens to you before your actually suppose to be off duty?” I would always tell him he didn’t have to give the time off, but he always did. I was selected as an Outstanding First Term Enlistee at Travis. Wow, that suckered me in, but I figured I didn’t have anything else to do and if I got out I wouldn’t have a job. Plus they gave me a bonus, ($1,100.00) and my base of choice, which of course was Kingsley Field, Oregon. I PCS’d from Travis AFB to Kingsley Field, Oregon in Aug 72. While stationed there, I had taken a part time job at a gas station and on day when I was working, a Volkswagen pulled up and this girl gets out and my mouth dropped. 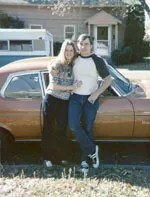 We dated for about 18 months until I got transferred to Goose Bay, Labrador in April 75. On her birthday in May’ 75 she broke up with me which really devastated me. We both went our separate ways and married other people. Her marriage failed and my two marriages failed as well. After 24 years we got back together and were married in 1998. I hated Goose Bay cause there basically was nothing to do. Especially since I worked the swing shift and when we got off there was no place to go. There was way to much snow. There was TV, but a person can only watch so much Hawkeye. 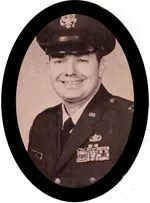 In April 75, I was transferred to Francis E. Warren AFB where I worked as Flight Control Facility Supervisor, Complotter and Assistant Flight Chief. I didn’t care for the missile field so much. I was there only 10 months when I got orders for England which would have been a two year assignment. I was tired of being moved around and I wanted to go to school, so I decided to get out of the service. Rocket Attacks , death threats, tornado, and flood. Receiving an OUTSTANDING in Aug 1989. Inspectors said: “Your Security Police Unit is rated Outstanding, One of the best Security Police Units we’ve observed in the last three years.” Receiving many, many, Letters of Appreciation, Commendations, and Superior Performance Ratings. Receiving a direct commission in 1981. My tour in Vietnam, I experienced 12 Rocket attacks which cause much damage and several injuries. In Feb 1971, SSgt Wissig and AIC Davis were killed when their jeep they were patrolling in ran over a land mine. My first 8 months in country, I worked as an Intelligence Liaison Officer working with the 1st Tiger Division, Republic of South Korean Army. On two occasions, my life was threatened by two intoxicated Korean soldiers. One was upset because I didn’t recognize him, and the other because I wouldn’t let him rub my leg. Koreans are very touchy-feely. Anyway they both had .45’s and pointed it at me several times, threatening to shoot me. Luckily I was able to talk my way out of being killed. Another incident while I was working with the Koreans, was when the Qhuin Nhon ammo dump blew up. I worked in the Tactical Operation Center under ground and I was on nights. The dump was 20 miles to our south and when it blew up, you first felt the ground shake and then the loud ‘boom’. You could see and hear the explosions for the rest of that night. I also was responsible for relaying enemy contacts and ambushes. The Korean compound was also an Artillery Base with a 105 Howitzer which we called Stumpy. When it went off, it made your ears ring. My last 4 months in-country I worked in law enforcement. Sometimes I was assigned duties as the NCOIC of the main gate. US Army troops sometimes would stop at the base for a little in-country R&R. When they arrived at the gate, they had to check their weapons. After their short stay, they would come back to the gate and retrieve their weapons before leaving the base. One incident was one of the soldiers was very intoxicated and my subordinate refused to give him his weapon. He started fighting with my subordinate and I ran over and assisted in apprehending and handcuffing him. The Army MPs who worked with me, whispered in my ear that we should let the troop go and his unit would take care of him. I agreed and we released the individual. After that, one of the MPs informed me one of the intoxicated individuals buddies had locked and loaded and pointed his weapon at me. The MP said he drew his weapon and informed the individual he didn’t want to do that. Of course I was very grateful. I had great respect for the MPs and sometime would work with them when I got off duty. Their NCOIC, Sgt Pendergraff transferred out, but before he did he gave me his NCO club card which allowed be access to the NCO Club even though I hadn’t been promoted to Sgt yet. He honored me when he said I was the only Law Enforcement Security Policeman who deserved it. I left Vietnam at the end of July assigned to Travis AFB. My direct commission from MSgt to Captain in Aug 1981. Air Force Commendation Medal for the period of 1 Aug 72 – 1 Feb 74: Sgt Leon T. Meek distinguished himself by Meritorious service as Security Force Communicator/Plotter, Security Alert Team Leader, and Munitions Storage Area Supervisor while assigned to the 827th Air Defense Group, Kingsley Field, Oregon, from 1 Aug 1972 to 1 February 1974. During this period, Sergeant Meek’s outstanding professional skill, knowledge and leadership aided immeasurably in identifying problem areas in the security police division and in developing and implementing the corrective actions capable of solving these problems. The distinctive accomplishments of Sergeant Meek reflects credit upon himself and the United States Air Force. The Meritorious Service Medal for the period of 8 Aug 1981 – 30 September 1989: Major Leon T. Meek distinguished himself in the performance of outstanding service to the United States while assigned to the 153d Security Police Flight, Wyoming Air National Guard, Cheyenne, Wyoming, from 8 August 1981 to 30 September 1989. During this period, Major Meek’s unsurpassed leadership qualities enabled him to direct and reorganize is unit’s mobility requirements, resulting in a decrease in unit equipment losses and man-hours for inventory. The result also created a quantum leap in the storage, maintenance, and operational readiness for all unit equipment. His analytical ability to solve problems and adeptness to priority setting resulted in the establishment and implementation of outstanding programs. Major Meek’s ability to make full and effective decisions and use of resources are outstanding and inspirational to security personnel. 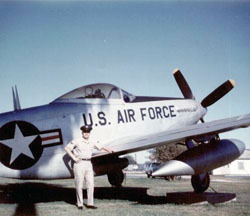 The singularly distinctive accomplishments of Major Meek reflect great credit upon himself, the Air National Guard, and the United States Air Force. My brother, SMSgt Lyle E. Meek. He taught me a lot during my time in the military and chewed me out when I really needed it. land and he jumped down my throat, chewing me out, up one side and down the other. He didn’t hold anything back. As he was chewing me out for complaining, he would poke his finger in my chest, hard. Basically he told me to stop complaining and learn the jobs of those above me, because they had more responsibilities than I could imagine. Best chewing out I ever had. Oh by the way. he wouldn’t hesitate to chew me out when I was an officer either. My first night in Vietnam. 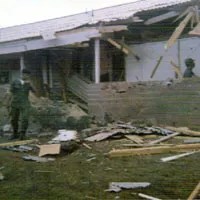 I was awakened by gunfire which was normal as the Security Police routinely set off flares, mortars and gun fire around the base perimeter which was called a” free fire zone.” At the time I didn’t know that nor did any one tell me to expect it. I was a little scared and nervous, but no one came and got us so I went back to bed figuring they would come and get me if they needed me. The Cheyenne Tornado. I had just pulled into the parking lot and was going to the hanger when everyone outside yelled at me about the tornado. Initially I didn’t believe anyone until I looked behind me and saw what looked like a dust devil and power lines exploding. I ran into the hanger for cover. When the tornado had passed, I went outside and it looked like we had been bombed. Cars, planes, and debris everywhere. We lost six of our eight aircraft. I retired from the military on 4 March 1990. 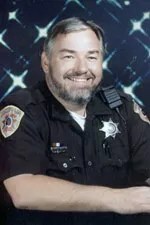 May 1990 I was hired as a Deputy Sheriff for Campbell County, Gillette, Wyoming. I retired from that on 8 Jan 2010. I went back to work for the S heriff’s Department for approximately 9 months as a Main Control Clerk until I turned 62. In Oct 2011, I worked part time as a Police Officer for the Gillette Community College until June 2013 at which time I retired and moved to Klamath Falls, Oregon. In April 1992 I was involved in a shooting. A suspect was very intoxicated and had beaten his wife and was looking for her with a gun. My Sgt, Cpl, and I arrived and eventually confronted the individual who pulled a gun and shot my Sergeant in the upper left chest. Myself and my Corporal returned fire, killing the suspect. I was told later by investigators it was good I had fired because we had saved our Sergeants life as the suspect had half cocked his revolver to fire a second shot. Presently I’m retired living in Kingsley Field base housing, in Klamath Falls, Oregon. Vietnam Security Police Association is basically the only one along with TWS. No benefits from this except for connecting with other veterans and looking for old buddies. I’ve thought about others like the American Legion or the VFW, but I really don’t like large crowds or noise. I also don’t like a smoky room and I don’t drink alcohol. I suffer from PTSD so I pretty much am a recluse. 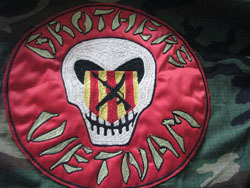 I was a member of some Motorcycle Clubs, ie., “Vietnam Vets” and “Bro thers Vietnam”. I left the “Vietnam Vets Club” because of some drug use and outlaw clubs they were hanging around with. I did remain with Brothers Vietnam until I moved and had to sell my motorcycle. I really enjoyed these guys as we were just a bunch of Vietnam Vets who wanted to hang out together and ride motorcycles. We were not trying to prove anything. Every Sunday in Cheyenne, Wyoming we’d all go to a truck stop for breakfast where we’d laugh and enjoy each others company and the truck stop were always ready for us when we got there. It gave me direction, discipline and self pride. It taught me many things about attitude and leadership. Back when I was young there was the draft and a lot of people were trying to avoid the draft. Many young people had no discipline or respect and had no thought of the future. In some ways I was the same. However, like the lyrics of the Charlie Daniels song “Still In Saigon” I was brought up differently, I couldn’t break the rules. Plus my father was retired Army and my brother was serving. I didn’t want to get drafted so I enlisted in the Air Force. As I said it taught me discipline, self pride and gave me a direction of where to take my life. Cooperate and graduate. You joined, now honor yourself, your family, and country and honorably serve. It’s all what you make of it. You can sit around a sulk because you didn’t get the career you wanted or you can make the best of it and do the job you were given. Many time during my career I he ard people complain they didn’t get the position they wanted or were promised. I was told by my father and then my brother to read the fine print, “And other duties assigned.” I wanted law enforcement, but got security police. When I was stationed at Kingsley Field Oregon, I requested again to cross train into Law Enforcement, but was denied. Made the best of it and eventually got a commission and became the Commander of both Security Police and Law Enforcement. If your going to volunteer for the military you must understand there are no guarantees. The needs of the military come first. Just thinking of the past from when I graduated from high school, attending college, enlisting in the military, my tour of duty in Vietnam, and the rest of my military career and other places I was stationed. Thinking of dates, times, and looking through old photos. 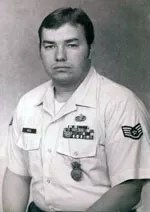 It would be great to find an old friend I served with or have them find me. It would really be great to be remembered and get in touch with someone and talk about the past.